The SL NITRO 510C is a cutting-edge RGB and W LED strobe luminaire that delivers intense bursts of colored and white light and dynamic effects. 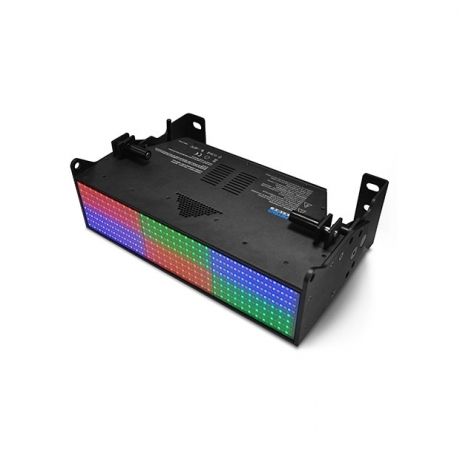 The tightly packed array of 264 high power fixed white LEDs and 264 RGB LEDs ensures maximum output for both traditional white effects and an almost infinite choice of color with full field and even distribution across 1200. The rugged construction, Showline standard LCD menu system, continuous-on operation and lower power consumption guarantee the SL NITRO 510C is the perfect strobe luminaire for any application. 120° beam angle. >50,000 lumens. Separate white emitters deliver a true white strobe effect without compromising performance. Unlimited continuous on and continuous strobe operation. Quick-connect system enables luminaires to be joined together side to side and top to bottom. Compatible with SL NITRO series and SL BAR 520. 264 high power white SMD LEDs. 264 high power RGB color SMD LEDs. Exciting multi-zone macro chases enable the quick creation of dynamic color and strobe effects. Variable strobe: 0-650 ms. Strobe rate: 0-30 flashes/second. DMX512-A / RDM. Local LCD menu system. 8-bit and 16-bit RGB and W control; 6 channel mode.